States can no longer legislate solely within their own boundaries; project aims address war, crime and privacy in cyberspace. The idea, he said, is to undertake a wide-ranging and in-depth study of the issues and set out a legal blueprint or framework that can be adopted — and where necessary adapted — by countries around the world as a basis for the new cyber reality. There are some research centers in the US doing similar work, but none of them has taken on the wide spectrum of legal and extra-legal subjects the Hebrew University team is planning to tackle, he said. The group of researchers will deal with issues such as what the responsibility of the state is regarding cyber offenses; how to define the right to privacy in the cyber realm; and what characterizes cyber-crime and cyber-terror. It will also focus on the legal protection against threats to human rights and national infrastructure as a result of the misuse of cyberspace. The project will be divided into three sub-groups. One will relate to international law and address the questions: Can current rules that regulate armed conflict between countries apply to cyber-warfare? And if not, what are the rules — including human rights rules — that should apply? The next will address the issue of privacy and intellectual property and examine the questions: when information flows from one location to another, in cyberspace and stored in the cloud, who is responsible for this information? Who does it belong to? If an idea is created online, who holds the right to its intellectual property? The third sub-group will deal with profiling cyber-criminals: Who are these criminals and what deterrents can be put in place against cyber-terror and cyber-crime? 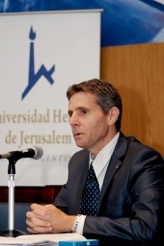 The team of 12 researchers, most of them from the Hebrew University of Jerusalem, will include retired general Danny Efron, a former Military Attorney General in the Israeli Army; Prof. Oren Gross of the University of Minnesota; Prof. Michael Schmitt, US Naval War College the drafter of the Tallinn Manual on Cyber Warfare. They will be joined in their task by computer engineering and other experts, local and foreign, to help them understand the challenges of the job. At the end of the two-year project Shany hopes there will be a three-year extension. The original source: – SHOSHANNA SOLOMON Times of Israel.